Last week I attended a Summer Reading workshop in Questa, NM. The library was too small to hold the workshop so they found a local gallery willing to lend us their space for the day and once that was finished I headed over to the library to visit. 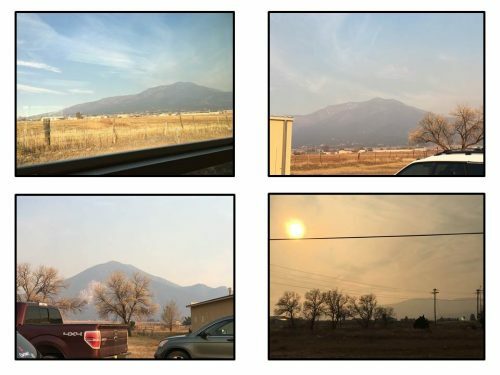 The library is situated in an absolutely breathtaking location, at the base of the northern Sangre de Cristo mountains. Unfortuantely, the day I was there there was a fire somewhere in the mountains so the view was hazy. Inside the library, it’s bright and spacious. Half of the building is taken up by their children’s collection, along with a large table which was occupied by a knitting/crocheting group the day I was there. 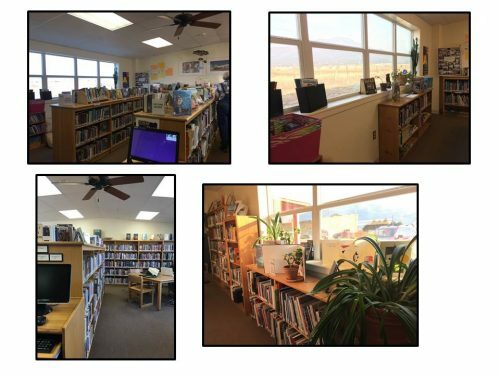 The other half houses their adult collection and public access computers. The outside of the library has a beautiful mural painted by local junior high students. 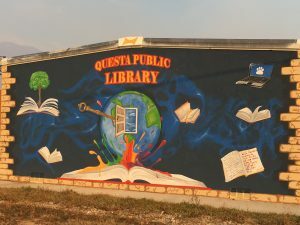 If you’re ever north of Taos, make sure to stop by Questa and visit their beautiful library!